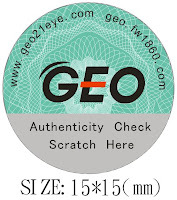 Q: How can I know the GEO lens that I purchase is authentic ? GEO has announced Anti-Fake System from April 2009. You will receive our lenses together with the stickers which have 20 digit hidden code to check the authenticity. .